Stars: Kenneth Branagh, Deborah Mailman, Everlyn Sampri, Tianna Sansbury, Laura Monaghan, David Gulpilil, Garry MacDonald. After several big budget Hollywood thrillers (Patriot Games, The Bone Collector, etc), Phillip Noyce returns home for this rather small scale but very topical film exploring one of the more controversial chapters of Australia’s recent history – the issue of the stolen children. Set in 1931, the film, based on a true story, follows the adventures of three young girls as they travel 1200 miles across some of the most inhospitable country in Australia to return home to their family. Molly, Daisy and Gracie (Everlyn Sampri, Tianna Sansbury, and Laura Monaghan) are three half caste girls, who are taken from their mother and sent to the Moore River detention centre, where they are to be assimilated into the religion and culture of the white man. But after a few days they run away and try to make their way home, against enormous odds. They decide to follow the wire fence that stretches across the state, followed by an aboriginal tracker (David Gulpilil), who comes to admire them for their courage and determination, and half the police force of the state. 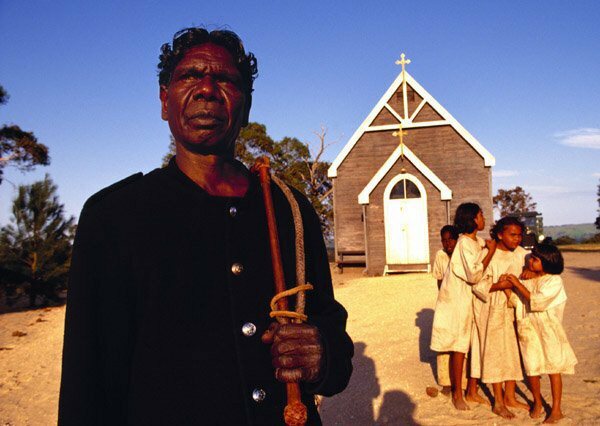 Rabbit Proof Fence seems unduly manipulative in its treatment of this story, and it seems that many commentators have chosen to follow a politically correct line when talking about the film, overpraising it for its political correctness rather than its content and quality. The film has been beautifully shot in widescreen by Christopher Doyle, but there are only so many shots of children walking through an endless desert that one can take before the whole thing seems repetitive and tedious. Peter Gabriel’s soundtrack is also quite evocative. Noyce has dealt with indigenous issues before, in his Backroads (1974), and he seems to have empathy for the girls’ situation here. The three young girls are played by young aboriginals who have no previous film experience, and they all do a superb job in difficult circumstances. A O Neville, the protector of the aborigines, is treated in a surprisingly evenhanded and balanced manner, portrayed as a man who was simply doing his job as he saw fit. Kenneth Branagh is good in a role that could so easily have been distorted to paint him as an outright villain, and he brings a sense of decency and even sympathy to his performance. In small but important roles, AFI award winner Deborah Mailman (Radiance, etc) and Garry McDonald contribute effective performances.